It’s Time For A Mutiny! It is with great pleasure that I can announce that several of my friends and I will be starting a new board game publishing company called Moon Yeti Games. (Website up but still under construction). Our philosophy is that we are enthusiast gamers seeking to publish great games. That’s it. Plain and simple. We love gaming. We love all different kinds of games. But the one thing that will be consistent across all of our games is that they will be great games produced with the highest quality. So as a fun thing to help with publicity we decided to not just make business cards but rather make business cards that are also a microgame. That’s where the Mutiny begins! You are the crew of the HMS Moon Yeti. One of you is planning a mutiny. The Mutineer’s goal: to survive while the others attempt to discover you. Players take on the role of one of the 4 crew members on the ship: Chaplain, Boatswain, Helmsman, or Navigator. Roles are public knowledge, but the identity of the mutineer remains hidden. Over the course of two rounds, players try to discover the mutineer through discussion, accusation, denial, and special actions. The game ends with a vote to convict one player as guilty of mutiny. If the mutineer is voted guilty, all the other players win. Otherwise, the mutineer wins. Each role has unique abilities that may help reveal the mutineer or allow them to exert control over the the voting. Since any player could be the mutineer, an accusation could be helpful, or a clever attempt to re-direct suspicion elsewhere. 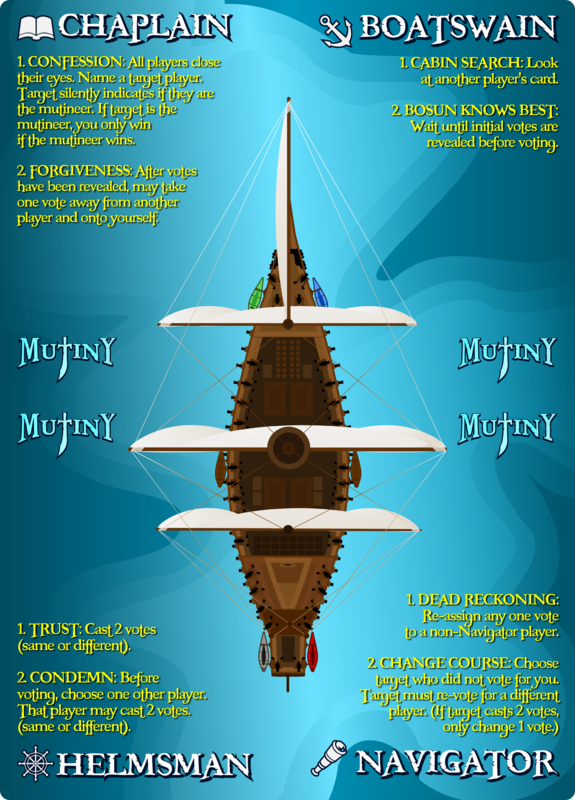 Mutiny is a social game with a minimal rule set. The game instead relies on player discussion and interaction to drive the game. Mutiny was designed by Adam Buckingham. It is simple, clever, and hilarious. This is a game for 4-6 players that takes about 10 minutes to play. Play it in line with friends at your favorite coffee shop. Play it at the bar when your enjoying a nice craft brew. Play it anywhere you want! All four cards together form the HMS Moon Yeti. CHAPLAIN: The Chaplain is the moral center of the ship. They provides counsel for the virtuous, and cover for the depraved. Crew mates may find themselves compelled to confess their sins, but can rely on the complete discretion of the Chaplain. Desperate crew mates covet the forgiveness that only the Chaplain can provide. Be wary, the Chaplain’s piety may be wielded in an attempt to cover seditious intentions. BOATSWAIN: The Boatswain is the foreman of the ship’s deck crew. With unprecedented access to crew cabins, crew mates will find it hard to keep their secrets hidden. Bosun keeps ears open and knows how the votes will fall before they are cast. With the rabid loyalty of the crew, there is nothing so dangerous as a defiant Boatswain. HELMSMAN: The Helmsman steers the ship. While the title puts them a step below the Captain, the crew trusts them more than any other crewmember. The Helmsman’s position manifests as greater influence over the crew’s decisions. A rebellious Helmsman wields a power that is very hard to contain. NAVIGATOR: The Navigator sets the course for the ship. When the ship isn’t headed in the right direction, it’s the Navigator who sets things right. Holding tight to the tools of their trade, the crew may not recognize a rogue Navigator until it’s too late. Each character has a first round and second round ability that strongly influence the game. Each time you play it you might be a different character. Or you might be the mutineer. Or the people you are playing with might be terrible liars. There is a lot of fun packed in this 4-card game! Will You Join The Mutiny? Here’s the deal… we want to start getting our name out there. So we printed up over 100 copies of Mutiny that we will be handing out at Gen Con. Our goal, through publishing great games, is to become a household name synonymous with gaming awesomeness. We believe Mutiny is an awesome 4-card game and we are excited to hand them out. If you are so excited about it, we have a PNP available on BoardGameGeek.com. Click here. We’d love to hear what you think and we can definitely answer your questions. So climb aboard and let’s set sail on this most grand adventure together! Posted on July 9, 2014, in The Boards and tagged board game publisher, board game publishing, Boatswain, bosun, chaplain, helmsman, microgame, Moon Yeti, Mutiny, navigator. Bookmark the permalink. 4 Comments. Wow! You are amazing. Do you ever sleep?? Hi Ed! Very excited about your new publishing company and to check out Mutiny. I also saw that Moon Yeti will be at Gen-Con this year for the Publisher Speed Dating event, and I was curious what kind of games you’ll be looking for. My husband Mark Major and I are bringing a couple late-stage prototypes with us, and we’d love to demo a couple with you if it sounds like a good fit. Let me know the best way to send you some more info! Thanks for your excitement! We will be doing the Publisher Speed Dating on Thursday. That will likely be the only time we are actively looking at games, though it won’t hurt to chat with us if you find us strolling around. In terms of what we are looking for, we want games that are great, innovative, accessible, and mostly fun. That’s pretty vague but the key is it should be great. The other option would be to find us in the UnPub area after hours. We will likely hang around there some evenings. It’s usually a fun place to hang out with other designers and some publishers.